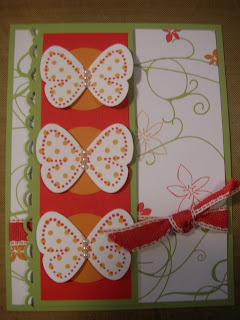 Over the next week, I will be posting the cards I made for swaps at Stampin' Up! 's Leadership Conference. I hope they give you some inspiration! This card was made with the Sunny Garden Designer Series paper and the Flight of the Butterfly stamp set. I used the current In Colors of Poppy Parade, Peach Parfait and Pear Pizzazz. While this was not one of my favorite swap cards, amazingly it swapped out first! What do you think? Leave me a comment!